Jameson Jenkins (1810?-1873) was an African American drayman – a carter or teamster – in Springfield from the late 1840s through the 1860s. He was a neighbor of the Lincoln family and was active in the Underground Railroad, which helped fugitive slaves escape from the South to the North. Jenkins was born in North Carolina. He was living as a free man in Wake County, N.C., during the summer of 1835, when he was given a permit to visit Guilford County, N.C., a Quaker community considered the Grand Central Station of the Underground Railroad in the South. The Quakers there most likely helped Jenkins begin his journey north across the Ohio River and into Indiana. In Indiana, Jenkins married Elizabeth Pelham, who had been born in Virginia and was, like Jenkins himself, a mulatto. They had a daughter, Nancy, in 1844. Sometime between Nancy’s birth in 1844 and 1846, the Jenkins family moved to Springfield. In 1848, Jameson and Elizabeth Jenkins joined the Second Presbyterian Church, Springfield’s abolitionist church. In Springfield, Jameson Jenkins became an entrepreneur. According to the National Park Service at the Lincoln Home National Historic Site, Jenkins “was an enterprising, comparatively successful businessman. A drayman, or teamster by occupation, he transported goods and sometimes people. He owned 50 percent more property than the average black citizen in Springfield at that time, suggesting that he owned and operated his dray or wagon.” Elizabeth Jenkins took in washing. The Jenkins family owned a home on the east side of Eighth Street, between Jackson and Edwards Streets, a block south of the Lincoln home. The Jenkins home no longer exists, but the lot on which it sat is part of the Lincoln Home National Historic Site. 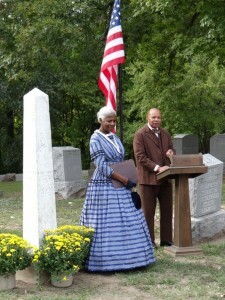 The lot also is included in the National Park Service’s Underground Railroad Network to Freedom. On the evening of Jan. 16, 1850, Jameson Jenkins helped a number of runaway slaves move 60 miles north along the underground railroad from Springfield to Bloomington. During the week that followed, Springfield’s newspapers printed five confusing and sometimes contradictory reports on the presence of the runaway slaves and called the events that transpired a “slave stampede.” It was initially — and incorrectly — rumored around Springfield that Jenkins had betrayed the slaves, resulting in the capture of some of them. On Jan. 17, 1850, the Illinois State Register reported that on the previous day Springfield citizens had captured 11 runaway slaves belonging to citizens of St. Louis. On the same day, the Illinois State Journal reported that 14 runaway slaves from St. Louis and Kentucky were discovered in Springfield on their way north. Three men attempted to arrest them, but a fight ensued. One slave, who was lame, was arrested and placed in the City Jail. On Jan. 18, the Register corrected its Jan. 17 report that 11 runaways had been captured. It reported that only eight were caught, and that after publication of the Jan. 17 paper, seven escaped. The remaining slave — the one who was lame — was “now in jail,” the newspaper reported. Three days later, the Register said the captured slave had been brought before the Illinois Supreme Court upon a writ of habeas corpus and released. On Feb. 11, 1861, Jameson Jenkins drove President-elect Abraham Lincoln on his last Springfield carriage ride, from the Chenery House at Fourth and Washington Streets to the Great Western Railroad depot — now the Lincoln Depot — as Lincoln began his trip to Washington, D.C.Late in life, Jameson Jenkins became a courthouse messenger in Springfield. He died on Feb. 3, 1873 and is buried in the former “Colored Section” of Oak Ridge Cemetery. This entry was posted in African Americans, Early residents, Ethnic groups, Historic Sites, Lincoln, Abraham, Prominent figures and tagged Lincoln Home National Historic Site, Second Presbyterian, Underground railroad. Bookmark the permalink. i really needed this info thank you very much !!!! thank you very much for the info !! !